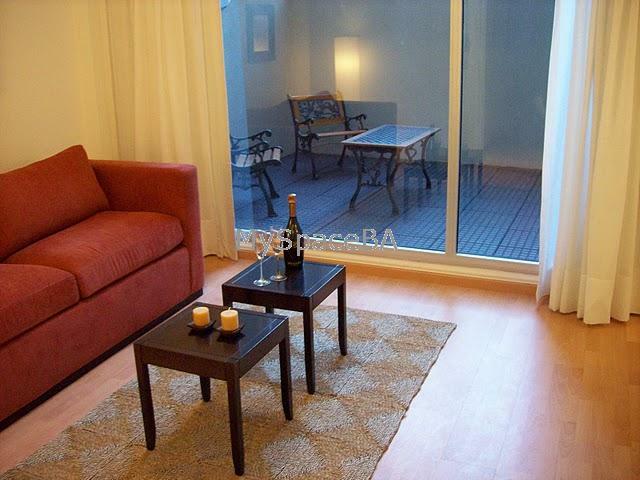 Delightful and comfotable one bedroom apartment located in Belgrano. The apartment is very lightful, totally furnished and with winter yard. The living area has a sofa be and a coffe table. The dinning area has a table and chairs for 4 people, an LCD 32" and aircon. The bedroom has queen size bed or twin beds, a wide closet with sliding mirror doors and an ample window and a studio space with a desk and computer. The kitchen is open to the living and dinning room areas. It is totallly equipped and it has a fridge, a microwave, a coffe machine, a toaster and a breakfast bar. The bathroom is totally complete with bathtub, shower and towells and sheets are included. This apartment has a back winter yard, Air Conditioner, Internet, LCD 32", Cable TV, Computer desktop, Towells and sheets, Fully equipped Kitchen. Brand new building , Elevators, Doorman 24hs . Train station, Subway, Universities, Commercial Area, Residential Area, Parks, Church, Restaurantes, Bars, Banks, Exchange House.